The foundation stone of the new church was laid 25 July 1869. Dr. Neal McCabe, Bishop of Ardagh, was the preacher. The Church of Immaculate Conception was opened in 1872 when Fr. Peter O’Reilly was Parish Priest. William Hague, one of the leading architects of his time, designed the Church. The Church is neo-gothic in style, and like all such churches, should obviously have stained glass windows as a feature. Clearly, finances were not sufficient to provide these and the windows were glazed in plain glass. Fr. Flood oversaw the completion of the building, the sanctuary and High Altar, by 1885. The Fatima Shrine, in the grounds of the church, was developed between 1946 and 1947. The Sicilian marble statue of Our Lady in the shrine was gift from one of the parishioners. Panel 2. The Apparition of the revolving suns. Panel 3. The Apparition of Our Lady to Lucia. One of the leading art critics at that time described the windows as follows, “probably the most varied and generally satisfying composition we have yet seen from Evie Hone.” Three other windows designed by Evie Hone were installed behind the High Altar. They illustrate the Crucifixion, the Annunciation and the Ascension. The next windows to be commissioned were two sets of windows from Harry Clarke Studios. The Windows were installed on the side walls of the church. The ones on the north side illustrate the Joyful Mysteries of the Rosary, while the windows on the south side illustrate the Glorious Mysteries. There are two other windows at the back of the church which are both by Harry Clarke Studios and were installed in 1961 and 1962. One illustrates the Martyrdom of St. Oliver Plunkett and the other depicts St. Patrick lighting the Paschal fire. The window installed behind the side altar of the Sacred Heart is abstract in design. It has as its theme, the Eucharist. Fr. Marry commissioned this window during the late 1940s. Margaret Becker designed the small windows installed in the present Blessed Sacrament chapel. 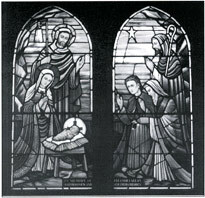 St. Brigid, Sr. Ernan and St. Ann with the infant Mary are depicted in these windows. They were part of the programme of renovation undertaken by Fr. Farrell, and completed in 1988. A new electric organ was installed in 1962. In January 1965 a new pulpit was erected and a new set of Stations of the Cross was purchased. 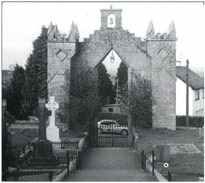 All this work was part of the preparations for the centenary celebrations at Kingscourt church in August 1972. In 1981, a marble altar, ambo and chair were added to the church. 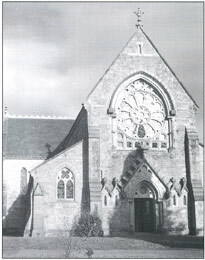 On 14 November 1984, a committee was formed with a view to renovating the church. The first meeting took place almost two years later in September 1986. Scaffolding was erected to inspect the roof later that year and early in 1985 Philip Hickey and Sons commenced work on its renovation. During spring and summer 1987 the church ceiling was taken down so that insulation could be fitted in the space above it. A new heating system was installed, and two new porches were erected. When Fr. 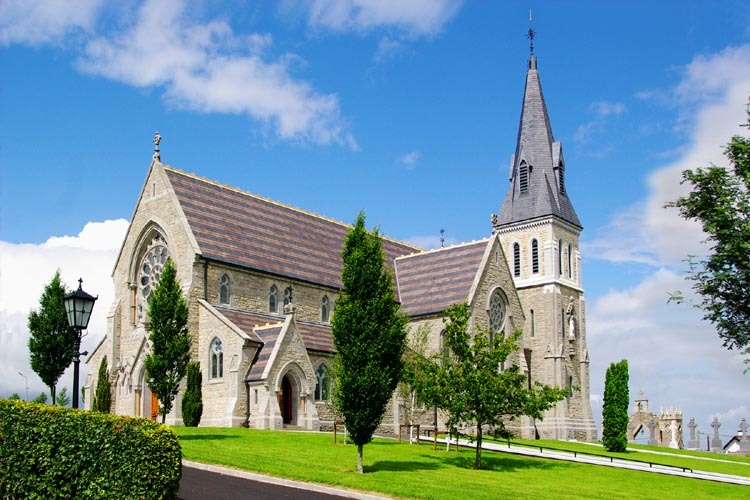 Farrell was appointed as parish priest in September 1987, he continued the work that was already started and completely renovated the three churches in the parish, built a new parochial house, a new school at Muff and refurbished Kingscourt and Corlea Schools. A new electric organ was installed in 1999 and the older one was given to Muff Church. The project to install the rose window during the Jubilee year was conceived as a paying tribute to the sacrifices and generosity of those, who in times of hardship, contributed to the building of the Church. Eoin Butler of Emerald Glass, Tullamore, designed the window. The theme of this window is the New Creation. It represents the stages of the Creation story, according to the Book of Genesis. One of the observations made the installation is that the stonework of the window is incredibly precise and accurate. The masons who fashioned the window were craftsmen of the highest calibre. Gradually, the grand design of William Hague, for the Church of the Immaculate Conception is coming to its full realization. It is noted that the church steeple has never been completed. No doubt the reason for this was lack of finance. Some have suggested that the spire was not completed because it was feared that the foundations weren’t good enough. It seems highly unlikely that an architect of William Hague’s stature would overlook such an important factor in his design. The church is sitting on solid rock, so a weak is an unlikely explanation for the unfinished spire. We should marvel at what the parishioners of the period 1860 to 1878 achieved and be grateful for their loyalty and generosity. 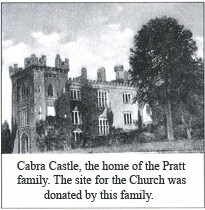 *The text above is taken from ‘Kingscourt – A Journey of Faith’ published in 2000. Photograph of Kingscourt Church in 2012 also showing completed church steeple.